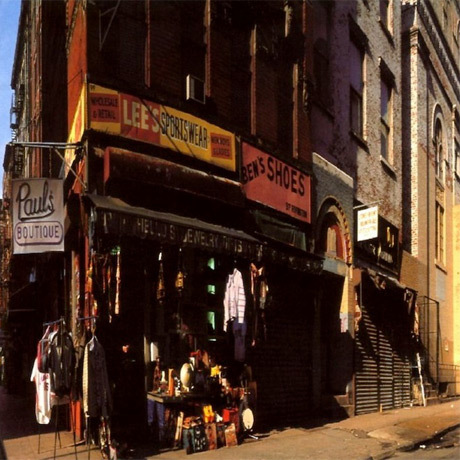 With the Beastie Boys' classic Paul's Boutique celebrating its official 25th anniversary today (July 25), the owners of the iconic New York City storefront shown on the album cover have revealed plans to toast the rap trio with a new mural. Brokelyn [ via Rolling Stone] reports that local artist Danielle Mastrion will begin painting a Beasties-inspired tableau onto the wall outside of sandwich shop Wolfnights tomorrow. When the album cover was shot, the storefront had been occupied by Lee's Sportswear. Mastrion will begin painting the mural tomorrow at 11 a.m. EDT and will continue to do so until it's done. Apparently the project was steered by LeRoy McCarthy, whose proposal to rename the Lower East Side street corner on which the building rests "Beastie Boys Square" was rejected earlier this year. At the time, the Community Board 3 had rejected the proposal on the grounds that it could not be proven that the Beastie Boys had contributed at least 15 years' worth of community service to that specific area to be granted the tribute. "My decision was based on the fact that it did not meet the criteria and the fact that previously our most recent group of co-namings held each application to the high standard of meeting every single criteria we set out for co-namings," board chair Gigi Li told DNA Info at the time. McCarthy, who had also pitched the idea of a Notorious B.I.G.-saluting "Christopher Wallace Way," was henceforth banned from reapplying for street corner namings for five years. UPDATE: You can see the finished mural below.